This article will walk you through how to test your new return portal. For the first part of this tutorial, we will focus on the customer interface, what we call your return portal. We will start by creating a test order. The easiest way to create a test order is to buy something directly on your website. Don’t worry: in this tutorial, we will show you how to refund this order! Once the order is completed, make sure to take note of the order number and the email address associated with this order. We will need them in the return portal. Note that you can also manually create an order from the Shopify admin as well, if you have the permissions to. Just head to the Orders admin and click on "Create order". This will allow you to simply mark the order as paid, so you won't actually need to pay for anything. Alright! Once your order is completed, it's time to request a return. In the merchant dashboard, you can click on the top-left link directly to access your return portal. Welcome to your new return portal! This is where your customers will be able to request returns. We will request a return for the order we have created at Step 1. Just enter your order number and email address and click on “Return Items”. Your order should now show up in the return portal. Select the items that you want to return. Note that some items can be marked as non-returnable. Those rules are editable in your Settings. Select a reason for the return. If you have ordered multiple units of the same item, you will also need to specify the quantity that you want to return. Once everything is complete, click “Next”. Based on the configuration of your return policy (which you can edit in your Settings), you should now see different return options. Click on one of the return options. If you do not see any return options or if you get a message saying that the order is outside of the return window, you probably need to review the setup of your return policy. You can do it in your merchant dashboard, in the Settings, under Policies. Step 6: The return is requested! Good job! You have just created your first return request! If your account is already set up with automatic label creation, you should receive an email automatically with the shipping instructions and the label attached. If your account is not set up for automatic label creation, the merchant (you!) will need to generate and attach a label to your return, and you will then receive the confirmation email. Please note that you will not receive a confirmation email until the label is attached to the return. However, you will receive a notification from Return Magic saying your customer is waiting for a label. Of course, you can also decide not to send return labels to your customers, in which case a different email is sent out (it does not contain a return label), or manually approve returns before the customer gets their return label. This is editable in your Settings, under Policies. For the second part of this tutorial, we will focus on the merchant interface. You can now log in to your Return Magic app. Head to your Shopify admin, under Apps. Click on Return Magic: we sit directly within Shopify! In the “Approved” list*, you should see the return that we have requested in Section 1. If your account is set up for automatic label creation, you should see the tracking number of the label in the list. If your account was not set up for automatic label creation, or if Return Magic received an exception from the carrier, you will see a purple message saying that you need to create a label manually. Don't worry, we'll get you sorted (see below)! *If you've set up a manual approval flow in your Settings, then the return will be in the "Requested" list. Click on "View Details" in the purple error box. Most common error messages have their own Help Center article in the "Carrier Integrations" section: we recommend taking a look at this to solve the issue yourself. If the error message is not in that section, then please reach out to us with the return number and we'll get you sorted! Otherwise, please jump directly to Step 3. If you need to upload a label manually, you can click on the “Customer needs a label” message, and follow the on-screen instructions. Please note that you will have to generate a label outside of Return Magic, directly on your preferred carrier's website. The first step of the return flow is to mark the return as received (or approve it first, if you've set up the manual approval flow). Don’t worry, the refund will not yet be approved, nor the inventory processed. The goal of this step is to keep the customer updated and to confirm that you have received the package. Note that this is not done automatically when your carrier marks a package as received - this feature is part of our Advanced Logistics add-on. Once the return is marked as received, it will be moved to the “Received” list. This is where your warehouse team (or you!) will have to validate the quality of the inventory. The system will ask specific control question for each item. Of course, you can customize the list of control questions in your Settings. You can check the list and click on “Submit Inventory Control”. This will not have any impact other than allow you to track the quality of your returned inventory. The last step of the return flow is to approve the refund. On this screen, you can see the details of the order and the refund, and you also have access to the details of the transaction that will happen. All the values of the refund can be edited, so you can, for example, decide to force a store credit refund, even if the customer requested a refund on their original payment method, or you can change the return fee. Once everything looks good, you can confirm the refund. Amazing! The test order should now be refunded! Finally, we suggest to always verify that everything works well. To do so, you can visit the “Refunded” list of your dashboard to make sure that the return was refunded. You should see the confirmation number of the transaction in this view. You can take a look at this video for a full flow of the portal, and this one for a full flow in the dashboard. 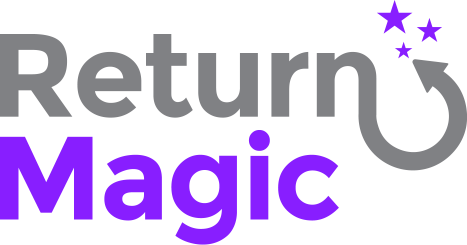 Thanks for reading this tutorial, we hope that it helped you understand how to use Return Magic and please let us know at support@returnmagic.com if there anything we can improve or if you have any questions!